The Workers' Compensation Notice for the Commonwealth of Virginia is a workers compensation law poster by the Virginia Employment Commission. This is a mandatory posting for all employers in Virginia, and businesses who fail to comply may be subject to fines or sanctions. The "Workers' Compensation Notice" (VWC 1) advises employees and employers of their rights and responsibilities under the Workers' Compensation Law in case of injury or occupational disease. The notice must be posted by every employer subject to the Virginia Workers' Compensation Act. It appears you don't have a PDF plugin for this browser. 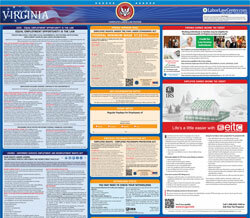 Please see the link below to download virginia-employers-workplace-notice-form-1-0.pdf. accident or notice of the occupational disease. a person in their behalf. unication of the diagnosis of an occupational disease. filed within two years; one year in death cases. 2. Report the injury	 to the Commission through your carrier or directly to the Comm	ission.